The NetOps Bundle enables you to build a picture of your network by analyzing ExtraHop&apos;s wire data and flow data. By integrating ExtraHop&apos;s wire data visibility with NetFlow, the NetOps Bundle aims to consolidate NPM metrics into three, information-dense dashboards that network engineers can view to perform L2-L4 network troubleshooting and in-depth analysis. The NetOps Bundle also provides insight into VoIP activity. 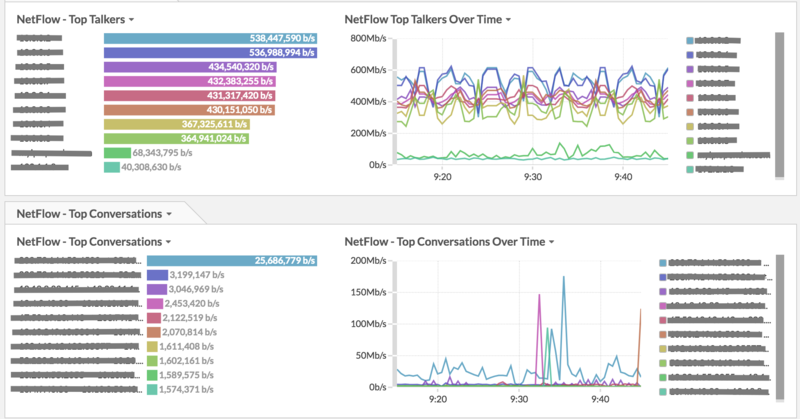 The NetOps -- Activity dashboard displaying the top talkers for NetFlow, top conversations, and interface utilization. The NetOps -- Performance dashboard displaying TCP critical indicators for all devices and network throughput. The VoIP Dashboard displaying all VoIP Devices. Log into the ExtraHop Web UI and install the bundle. Enable both the NetOps: VoIP trigger and the NetOps: Active Calls trigger. Make sure to check the Apply included assignments checkbox during the bundle installation process. This option will automatically assign the triggers to the correct sources. (Optional) On the NetOps -- Activity dashboard, assign sources for Interface Utilization charts. Interface Utilization charts do not display any data by default because sources have not been assigned to them. To add a source, click the chart name, click Edit, and then click Add Source. Add each NetFlow interface that you would like to view data for. (Optional) On the NetOps - Activity dashboard, modify the source for Top Protocol charts. Charts in the Top Protocols region are assigned a network capture source by default. If you want to change or add sources, click the name of a chart, and then click Edit. Add or modify sources as needed. Configure the timeout for SIP traffic monitoring. Log into the ExtraHop Admin UI on your Discover appliance.